When you find the best cat brush, you and your cat will both know it. Good brushes feel great in your hand, are gentle on your cat’s skin, and are a perfect fit for their coat type. 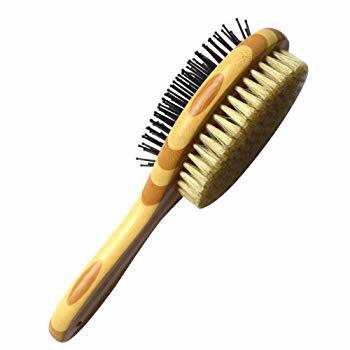 Because it’s affordable, easy to use, appropriate for all coat types, and has hundreds of glowing customer reviews, we’ve selected Safari’s self-cleaning slicker brush as our number one pick. We’ve also chosen the best brushes for special needs, including sensitive skin, various coat types, and matted fur. Before we jump into individual product reviews of the top 10 best brushes on the market, let’s talk about the types of cat brushes available, identifying which brushes are best for certain coat types and personalities. These brushes have fine wire teeth set on varying angles. 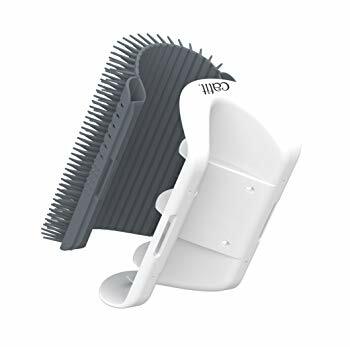 Because the wire teeth comb through your cat’s fur from multiple angles, they are very effective for removing loose hair as well as dirt and dander. The thin metal tines aren’t painful for most cats, but can irritate sensitive skin. If your cat has damaged skin or is particularly sensitive to touch, you may choose a rubber brush or grooming glove instead. Don’t use a pair of scissors to cut out a mat. If your cat flinches or you snip in the wrong place, you could cut their skin instead of the matted fur. Instead, use a dematting tool. These tools have sharp blades with rounded tips. They scoop underneath the mat and gently cut it out without harming the skin underneath. The great thing about grooming gloves is that they aren’t brushes. They’re gloves with small rubber nubs and bristles that gently massage your cat’s coat and draw out loose hair. Instead of feeling alien on your cat’s skin, the touch of a gloved hand is comforting and natural. A bristle brush smooths and beautifies the hair. They’re popular among show cats and other felines who need to look shiny and fabulous. They make an excellent finishing brush for coats of all types. Rubber brushes have wide-set rubber teeth, which gently move through the fur, detangling and removing loose hair. The rubber teeth provide a gentle massage, improving circulation and skin health. They’re a gentler, kinder choice for cats who can’t tolerate harsh metal brushes. Remember that your cat’s coat has three different layers. Most cats have guard hairs, awn hairs, and down hairs. The thickest, densest layer is the down or undercoat, which lies at the base of the coat, nearest to the skin. Cats with particularly long, dense undercoats are prone to matting problems and severe shedding. The undercoat can also make a cat overly warm during hot weather. Deshedding tools reach deep through the layers of your cat’s coat to access the soft, dense undercoat. When used on a cat with a thick undercoat, deshedding tools can produce dramatic piles of downy hair. These combs have long teeth that pick through your cat’s coat, removing loose hair and gently detangling. They can help to prevent mat formation. While these are useful for cats with longer coats, they’re not the best choice for cats who don’t like brushing. Detangling combs aren’t soft and do little to massage the skin. A pin brush is similar to a slicker brush, but has more widely-spaced teeth and is a less aggressive grooming tool. The pins are tipped with plastic balls that massage your cat’s skin and distribute oils through their coat. How did this brush earn the number one place on this list? It’s versatile—you can use it on almost every coat type, including short, medium, and long hair. It’s thorough—the brush captures loose hair from the undercoat, massages the skin, and distributes oils for a healthy sheen. This brush has stainless steel pins that gently but effectively comb through the coat, removing loose hair, loosening tangles, and extracting dirt and dander. And finally, it has a user-friendly design. The handle has a soft grip and hand-friendly shape that make it easy and comfortable to use. Most other brushes don’t cleanly collect hair. Instead, they send it flying through the air as you groom. This brush keeps most of the hair securely on the wire teeth. Once you’re done brushing, you can easily retract the pins to release a clump of hair neatly into the trash. While this dematting comb isn’t the best choice for every cat, it’s essential for long-haired cats who regularly develop mats or tangles. The dematting comb has sharp stainless steel blades that zip through matted clumps of fur. Because they have dull rounded ends, the blades pose a threat to the hair only. They won’t cut your cat’s skin. 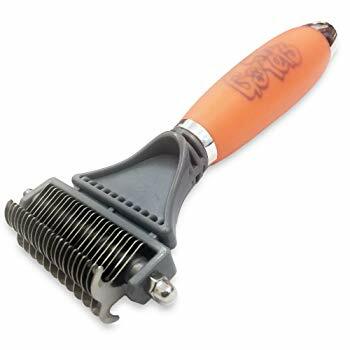 It’s a two-sided device that works both as a deshedding tool and a mat remover. The 12-tooth side works through thick, heavy mats, while the 23-tooth side is appropriate for weekly grooming and deshedding. This soft silicone brush is designed for short-haired animals. Its patented two-sided design features soft silicone nodules that draw out loose hair, stimulate circulation, and help to spread natural oils to nourish the skin and coat. It’s squishy and gentle, so it’s a great choice for cats who are irritated by firmer steel or hard plastic brushes and combs. This brush is a good choice for people who bathe their cats. It works as well wet as it does when it’s dry. The brush has “shampoo reservoir cells”, which hold cat shampoo during bathing. Another interesting feature of the brush is that because it’s made from 100% medical grade silicone, it’s dishwasher-safe. This makes it a particularly no-fuss product. This one is a classic. 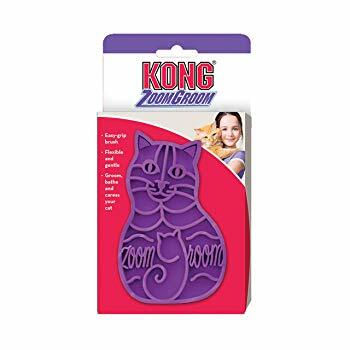 The KONG ZoomGroom is a cat-shaped little rubber brush that fits in the palm of your hand and gently removes loose hair from your cat’s coat. The wide-spaced rubber teeth are flexible, making it a gentle brush that’s easy on even the most sensitive kitties. 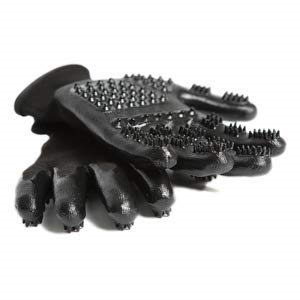 You can think of it as a massage brush that gently stimulates the skin without irritating it. While the ZoomGroom has great popularity thanks to its gentle groom-massage abilities, it’s not perfect. It doesn’t grab the hair very securely and, according to customer reviews, tends to send fur flying around. It can take off a lot of dead hair, but it will likely let it sprinkle down on your cat and furniture. Grooming gloves are a favorite among sensitive cats, especially those who love being petted, but hate the touch of a brush. If your cat is afraid of strange things running through their coat, a grooming glove is a calming alternative to traditional brushes. The HandsOn glove has a few features that set it apart from other grooming gloves, but sizing is the most significant point of difference. The glove is available in five sizes—junior, small, medium, large, and extra large. Because they fit so well, you can comfortably give your cat a very natural grooming experience. The bottom of the glove is covered in nitrile nodules. The fingers have longer bristles, while the palm is covered in slightly less aggressive massaging nodes. You can get it in black or green. Perhaps the most famous of all pet brushes, the FURminator is known for its extraordinary ability to extract hair from the dense undercoat. It has a stainless steel deshedding edge that reaches deep beneath the topcoat to access the fuzzy undercoat, capturing loose hairs and preventing them from gathering into mats or shedding throughout the house. The Furminator does a great job of smoothly collecting the hair and doesn’t send it flying around the room. Its ejector button makes it easy to discard collected fur. 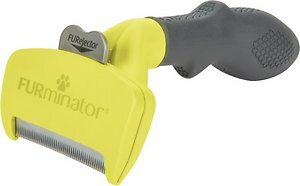 If you don’t want to spend up to $40 on the FURminator, this little deshedder is a great budget-friendly alternative. It’s designed to remove hair from the undercoat without pulling, snagging, or scratching your cat’s skin. In contrast to the sometimes-harsh metal teeth found on the Furminator, the Eazee deshedder has plastic teeth. 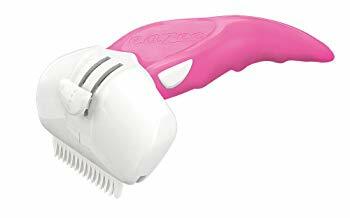 While it’s much cheaper and considerably less well-known than the FURminator, the Eazee deshedding tool has a few qualities that may make it a more desirable choice. The Eazee deshedder comes with two grooming blades, allowing you to choose between light and intense grooming. While you’ll have to buy an entire FURminator unit to accommodate a long or short coat, the Eazee deshedder effortlessly adapts to varied coat lengths. Every deshedding blade is reversible for either long or short coats. You can purchase the Eazee deshedder in green, blue, purple, and pink colors. Here’s an interesting twist on the traditional grooming brush. It’s a toy that allows your cat to brush themself and have fun while they’re at it. For most cats, a self-grooming toy like this is no substitute for a human-operated brush. That said, this can be an interesting alternative for fiercely independent cats who refuse to allow someone else to groom them. The Catit Senses 2.0 Self Groomer Cat Toy lies on the floor or mounts to a corner. You’ll use the included pouch of catnip to entice your cat to the bristled toy. If you’re lucky, the nipped-up cat will start to rub their face and body against the groomer. The bristles act like any other brush to remove loose hair and massage your cat’s skin. This is a German-made brush featuring real boar bristles set in a birch wood handle. The bristles are extremely soft, so the brush isn’t a good choice for heavy shedders or matted coats. It is, however, a good choice for sensitive cats with short coats. So if you’re looking for a soft, gentle brush that will give your delicate kitty a little extra shine, this boar brush is a serious contender. If you’re looking for a versatile brush that’s perfect for both long and short haired cats, this one might be a good choice. Because of its versatile design and the fact that it’s the right size for cats, dogs, and other pets, this double-sided brush is popular in multiple pet households. 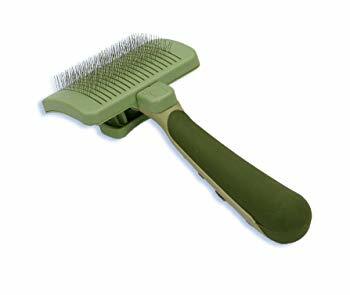 One side of the brush is a pin brush, which is appropriate for medium-to-long-haired cats. A gentle pin brush draws out loose hair and massages the skin. The other side is a bristle brush, which makes any coat look smooth and shiny. You can use both sides in a single grooming session, using the pin brush to remove loose hair and polishing with the bristle brush. Customer reviews indicate that the brush has a gentle touch and is comfortable in the hand. To minimize hairballs and prevent hair from depositing all around your house, brush your cat once a week. Here are a few tips to make grooming fun and effective. Start grooming your cat when they’re relaxed and in a good mood. Grab your brush and sidle up to your cat while they’re taking a nap or lounging in their bed. Don’t try to start brushing your cat while they’re eating, playing, or out for a walk. If your cat is licking themself, it’s a good idea to let your cat finish their own grooming session before you lunge in with a brush. Before you start brushing, run your hands along your cat’s body to inspect for lumps, wounds, or other abnormalities. Slowly and mindfully pet them, feeling for anything out of the ordinary. You do this for three reasons. One, you’ll notice if your cat has any sensitive areas that you should avoid with the brush. Secondly, this kind of inspection should be part of your weekly routine anyway. And finally, you’re priming your cat for physical contact, helping to make a natural transition from hands to brush. Brush your cat in the direction of their fur. It’s important that you let the brush flow in the direction of your cat’s fur. Brushing against the grain will pull the skin and irritate your cat. If you encounter tangles, gently tease them out. Use a dematting tool to cut out serious mats. If you have a long-haired cat, you’ll probably encounter tangles or mats. When you do, try to gently tease them out with your brush. If you can’t do this, a dematting tool can help you to slice them off. Once you’re done, give your kitty a treat. Most cats love being brushed, but that doesn’t mean that a reward isn’t warranted. Create positive associations with grooming time by giving your cat a treat after brushing time is over.